This man is a boss. 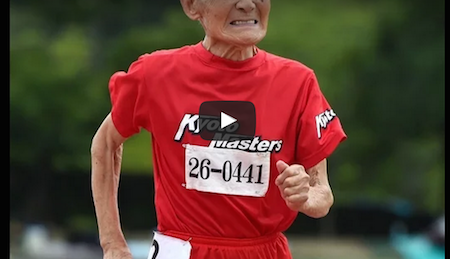 Hidekichi Miyazaki Started taking up running as a 90-year-old. He is the prime example that age seriously does not matter, if you persist, you can do it! Doctors have described him as a medical miracle, and we can see why. He has become the world’s oldest competitive sprinter, and he just broke his own 100 m record. His final time was 44.22, but for this man, that time wasn’t good enough. “I wanted to shave off a few more seconds, as I ran it in 36 seconds during training,” Miyazaki told reporters after the competition in Kyoto.’s nickname is The Golden Bolt, respectively named after Usain Bolt, one of the fastest men of all time.